“In the past, elections have been fought on issues like Emergency, Mandir, Masjid,” Mr Yadav said. He emphasised that there was a need for an alternative at the Centre but said that those who seek to oppose the regime in terms of policy and programme are no different. The only difference, he said, was that while the BJP thinks it can get votes by inciting hatred against the Muslims, the other parties think they can get Muslim votes. He was speaking on “Agenda and Action in Lok Sabha Elections, 2019: A proposal for Citizens” where he spoke about reforms document “Reclaiming the Republic” and Indian citizens action for nation-19, in the run-up to the Lok Sabha polls. The reforms document was drafted by experts, including lawyer-activist Prashant Bhushan and economist Prabhat Patnaik, under the chairmanship of former Delhi High Court Chief Justice A.P. Shah. 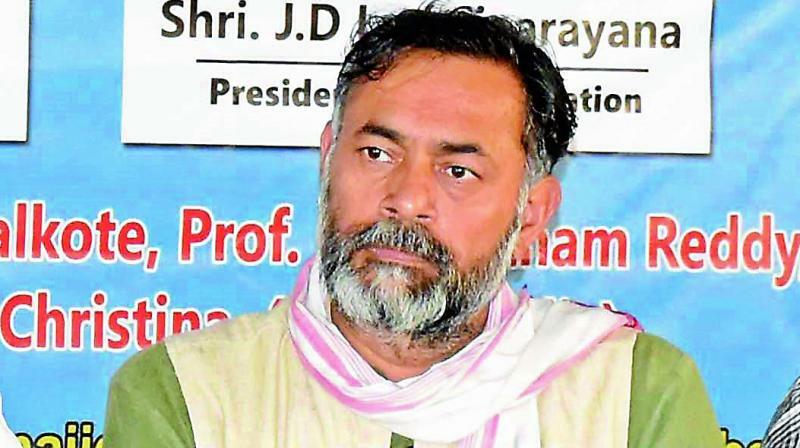 The event was held along with Telangana Jana Samiti and Prof Kodandaram said TJS would take the reforms document forward to the people of Telangana. “Lynching was unknown to the public. It was used in the US. The great achievement of this government is that the word ‘lynch’ has now become part of everyday vocabulary,” he said.